We yogis tend to value stretching our muscles. But what about stretching and mobilizing our nerves, which are, after all, the communication lines between our muscles and our brains? Restricted nerve mobility can lead to pain and interfere with yoga practice, as yogis with carpal tunnel syndrome, cubital syndrome, thoracic outlet syndrome, and sciatica know. According to Bill Reif, a physical therapist based in Atlanta with 40 years’ experience and the author of The Back Pain Secret: The Real Cause of Women’s Back Pain and How to Treat It, yogis can keep their nerves healthy and alleviate minor nerve problems by incorporating “neural glides”—or nerve stretches—into our yoga practices. The same daily activities that can shorten and tighten muscles—sitting, working at a computer with the shoulders rounded forward—can also inhibit the mobility of peripheral nerves (the nerves that run down the arms and legs), which run through and in between muscles on their course from the spine to the extremities. That “remembering” is due to the adhesions, or “sticky” places in the fascia (a form of connective tissue), that develop around muscles and nerves, often as a result of their immobility, and prevent the nerves from gliding. Adhesions can also result from an injury that causes you to limit your motion as you recover, or stem from repetitive movements like typing. “Repeated keystrokes or use of a computer mouse may cause adhesions, especially if your forearms, wrists, and fingers aren’t optimally aligned,” say Reif. In addition to sitting and computer work, poor posture, chronic misalignment, pregnancy, and injuries (such as whiplash) can lead to limited nerve mobility. Office workers, cashiers, medical professionals, assembly-line workers, mechanics, drivers—anyone who repeats the same physical procedure many times—are vulnerable to nerve problems, as are many athletes, especially if they participate in sports that involve repetitive arm or shoulder movement, such as baseball, swimming, golfing, volleyball, and weight lifting. Reif points out that any movement that requires an extreme range of motion for a sustained amount of time or over the course of numerous repetitions can cause or exacerbate nerve problems. This includes yoga poses like those of the “vinyasa,” in which the hands bear weight in plank, chaturanga, and upward facing dog. For those with wrists already made vulnerable by keyboard work and/or misalignments, the full wrist extension required in these poses may irritate the median nerve crossing the wrist. Reif points out that any movement that requires an extreme range of motion for a sustained amount of time or over the course of numerous repetitions can cause or exacerbate nerve problems. Nerve problems may be signaled by weakness, fatigue, numbness, tingling, burning, restrictions in range of motion, changes in reflex speed, swelling, or even feelings of heaviness or coldness. The nerves most commonly involved in these symptoms are the median nerve, ulnar nerve, radial nerve—all located in the arms—and the sciatic nerve, which runs from the lumbar spine down the legs into the feet. Continued irritation of these nerves may result in several common diagnoses: carpal tunnel syndrome (compression of the median nerve, running through the wrist), cubital syndrome (compression of the ulnar nerve, running through the elbow), thoracic outlet syndrome (compression or shortening of the nerves in the upper chest), as well as sciatica (compression of the sciatic nerve, commonly felt in the buttocks). By moving in non-habitual ways while aligning our bones optimally, as we strive to do in many yoga classes, we may prevent the formation of the adhesions that prevent the nerves from gliding. But the various asanas may not, in and of themselves, work to mobilize a nerve that’s already entrapped. As Reif explains, “The technique for mobilizing a nerve and stretching a muscle is different.” Physical therapists use neural glides to separate the nerve from fascial adhesions (“stuck” places in the tissue around each muscle) and scar tissue (in both muscles and fascia) via repeated movements that bring a limb from a position where the nerve is on its shortest path to a position where the nerve is on its longest path, in effect “flossing” the neural pathway. For instance, as is explained in more detail in #1 below, the right median nerve shortens when you move your right ear toward your right shoulder and bend your right elbow; it gets longer when you tip your head toward the left shoulder and straighten your elbow. Gentle side-to-side or back-and-forth movements can break up adhesions, freeing the nerves to move. “Neural glides are to be performed slowly, actively, and with precision,” Reif says. He emphasizes controlled awareness and muscular engagement with his patients as they perform these movements, since stretching passively can evoke a protective contraction of the muscles—the “stretch reflex”—in which they resist further lengthening. If you do encounter tingling or numbness, Reif encourages backing off the stretch until those feelings disappear, since those sensations could signal irritation or overstretching of the nerves. He promises that “Over time, you’ll be able to go further before you encounter this abnormal sensation.” Reif says that how shortened your muscles and nerves have become and the amount of time they have been shortened will determine the extent to which your mobility improves and how fast that improvement happens. Does everybody benefit from neural glides for the four nerves listed below? Neural glides may also be valuable preventative medicine for those who may be feeling neural tension in certain areas but whose symptoms have not yet escalated into a diagnosable syndrome. 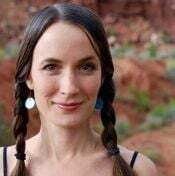 “Most of us will discover one or two nerves that do need gliding,” says Reif. Reif suggests holding each position in a glide for about twenty seconds, or two or three deep breaths, and repeating the entire glide up to ten times. The glides you find most productive can be practiced—in a series of ten—three or so times a day, on breaks during the workday or as part of your yoga practice. You can feel free to repeat a glide with more frequency on the side for which it is most challenging, often your dominant side. If you do a lot of typing, use a mouse, or perform activities that put pressure on the soft side of the wrist, and have been feeling tightness in your wrist, forearm, or elbow, your median nerve may need a stretch. 1. Standing with the right side of your body about an arm’s length away from a wall, place your right hand on the wall, at shoulder height, with your fingers pointing up and your right elbow bent. Tip your head to the right, and hold here for a few breaths. Here, in a position that shortens the median nerve, it’s likely you will feel no stretch. 2. Slowly center your head and press your hand against the wall thoroughly to straighten your arm and lengthen your median nerve. Next, tip your head to the left, away from the extended arm, moving your left ear toward your left shoulder. This further lengthens the median nerve, and should yield a stretching sensation. Hold for another couple of breaths. 3. Slowly tip your head to the right and re-bend the right elbow, returning to your starting position. Hold here for a couple breaths. Move your head to the left—straightening the elbow—and right—bending the elbow—several more times, always holding each position for a couple of breaths. It’s this side-to-side movement of the head combined with the bending and straightening of the elbow that creates the desired “flossing” effect, according to Reif. 4. Then, with your head tipping to the right, your right elbow bent, and your hand still on the wall, slowly turn your right hand clockwise until your fingers point behind you. 5. Press your hand against the wall, straightening your arm thoroughly, and center your head. Again, tip your head to the left and hold for a few breaths. Then, tip your head to the right, re-bend your elbow, and—with your hand still at the wall—turn your fingers to point up again. Rest here for a few breaths before repeating. 6. Repeat steps four and five up to ten times on the right side, then do the entire sequence, beginning with #1, on the second side. If you use a computer mouse or do other work that moves your wrist from side to side repeatedly, or if you are feeling tightness in your forearm, you may need a stretch for your ulnar nerve. 1. With your arms at your sides, bend your elbows and bring your hands in front of your chest, palms facing you. Bring your index fingers and thumbs to touch (making an okay sign, or jnana mudra with both hands) and straighten your other three fingers. 2. 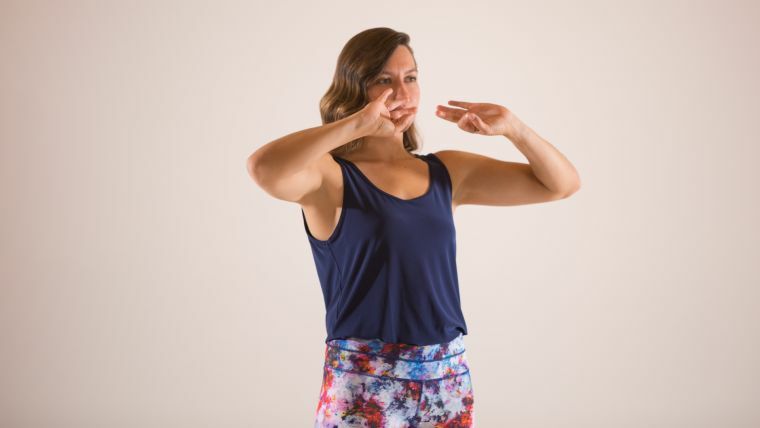 Over the course of a couple of breaths, lift your hands and slowly rotate your wrists to turn the palms first up toward the ceiling, then toward your face, leading with your pinky fingers. 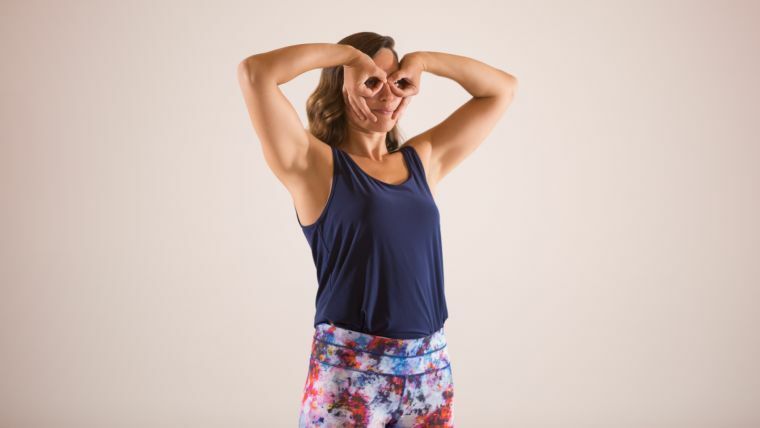 Keeping jnana mudra, encircle your eyes with your index fingers and thumbs, bringing your free fingers to your cheeks and pointing them down toward your chin, as if making a mask. 3. Hold the “mask” for a few breaths. 4. Over the course of a couple of breaths, slowly lower your hands to their starting position in front of your chest. practice it on that side more frequently, making the movement described above with only one hand. If you do a lot of computer work (or drop your wrists when you type) your radial nerves may benefit from a stretch. 1. Begin standing with your right arm at your side, palm facing in. Depress your right shoulder by reaching your right fingertips toward the floor. Inwardly rotate your right shoulder to turn the right arm in and the right palm to face out. Flex your right wrist so that your palm faces up and your fingers point away from you. 2. Tilt your head to the left, and hold here for a couple of breaths. 3. Now, lift your right arm a few degrees to the right. 4. Bring your right arm back alongside you, turning the palm to face your thigh and returning your head to its upright position. Pause here for a breath or two, then repeat the process. 5. For more intensity, after a few repetitions of the glide as described above, tilt your head to the left and move your right arm to the right and slightly behind you. Hold here for a couple of breaths, then lower your arm and lift your head. Take a pause for a few breaths here, before you repeat. Move through this sequence up to ten times on the right, then switch sides. If you do a lot of sitting at a desk, driving, running, or biking and are feeling tension in your lower back, buttocks, or behind your knee, you may need a stretch for your sciatic nerve. 1. Lie on your back, with your knees bent and your feet on the floor (hip-distance apart and a few inches away from your sitting bones) and your arms at your sides. Draw your right knee toward you, as if preparing to do reclining hand to big toe pose on your right side. If your back is sensitive, you can keep your left foot on the floor. If you experience no pain in your lower back, you are welcome to stretch your left leg out on the floor in front of you. 2. Grasp the back of your right thigh, near your knee, with your hands (or a strap or belt, if the back of your thigh is difficult to reach), and slowly straighten your right leg, flexing your ankle so that the sole of your foot faces the ceiling and your toes point straight back. Press your thigh into your hands, and your hands back into your thigh. 3. Slowly point your toes. Hold this position for a few breaths. Then flex your foot, reaching up with the heel, and hold that position for a few breaths. Continue pointing and flexing your right foot, spending a couple breaths with the foot pointed, then a couple breaths with the foot flexed. 4. To increase the intensity of the neural glide, raise your head slightly (this will lengthen the spinal nerves), and point and flex the foot repeatedly, as you did in step 3. 5. Slowly, over the course of a couple of breaths, lower your head and leg and bring your arms back alongside your body. Move through this sequence up to 10 times on the right side, then switch sides. If possible, after actively performing these neural glides, rest in savasana, a passive pose with a calming effect on the nervous system. Imagine relaxation coursing from your spine along the newly opened channels of your neural pathways all the way to your hands and feet.